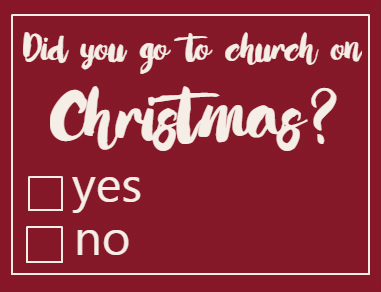 Did you go to church on Christmas Sunday this year? Did you take your kids to church on Christmas Sunday? I was stunned. I had to think for a bit about what it was that made me anxious about it … about dragging the kids out of the house when all they want to do is eat a nice breakfast, do a short, sweet Bible time, and play with their new toys–just like every other Christmas morning. I want to think that Christmas morning at home is sacred as well. Does Christmas morning have to happen in a church sanctuary just because it’s Sunday? Can Christmas morning at home be sacred too? Am I being … selfish? Andy didn’t understand why I got all nervous. I didn’t understand why, either, until I thought about it for a few minutes. 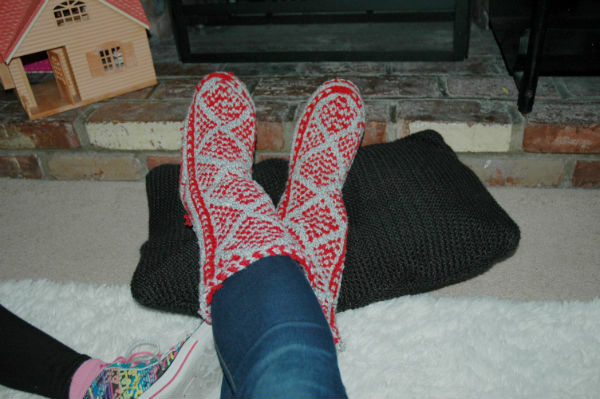 IDEALLY, CHRISTMAS MORNING SHOULD NOT BE STRESSFUL … Right? You see, my sisters and I will tell you that we do not have good memories of getting to church, especially on holidays. It wasn’t CHURCH that was the problem, it was the anxiety of getting ready and getting to church on time. Please don’t take this the wrong way. I know my mom and dad had the best intentions. I love that they love Jesus and wanted to be at church every Sunday. They were trying to do the right thing and bring honor and glory to God by having us attend church as a family. What will your kids remember? I wanted to honor Andy and what he wanted to do. I really did. So we attended church on Christmas Eve … but on Christmas morning, I just couldn’t do it after getting only a few hours of sleep. Andy ended up taking our oldest child to church Christmas morning. He said it was a lovely service, and that I really missed out. That made me sad. He was definitely OK with my decision to stay home with the other four kids, even though he wished we came too. But you know what? I am a bit precarious right now, and I really didn’t need to stress over going to church on Christmas Eve and Christmas Day. I don’t think it’s a bad idea to choose either Christmas Eve or Christmas Day to attend church. I don’t think it’s necessary to do both. What do you think? Should I feel bad for not going? What did you do this year? 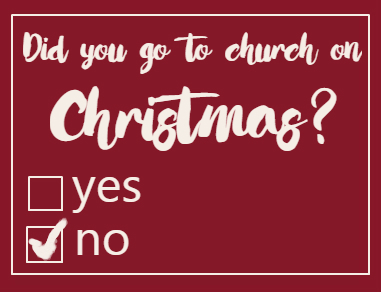 Did you attend church on Christmas Eve and Christmas Sunday morning, even if you have young kids? Do you have good or bad memories of going to church on Christmas morning when you were younger? I am a worship leader (and Mom of 5 kids) and we had a Christmas Eve and Christmas Sunday Service. They were both nice services. Our Sunday service had more in attendance then our Christmas Eve Service….which surprised me! We had so many Christmas Services this month that by the time we got to Christmas Day, it was just another one! I was exhausted and to be honest, I didn’t enjoy it like I should! It is tough on the Pastoral Staff. Hello Kathy! Thanks so much for sharing this! I was telling my husband what you wrote because another friend said the same thing. My husband was on staff at our church for 10 years so we know that kind of busy life. I realized that if I don’t go to the Christmas service that all of you have worked so hard to prepare, then it could come across that I am disrespecting all the hard work and the sacrifice you all have made. Also, after posting this, I had a lot of friends comment on Facebook that their churches did not hold Christmas Day services in order to let their staff members have the day off and be with their families. Definitely something to think about every 7 years! God bless you for all of your hard work and dedication. Leading worship with 5 kids? Wow!!! and Happy New Year, Kathy! So, as you know having been married to a pastor, it takes a lot of staff/volunteers to run services. Our church really debated what to do since we hold 4 evening services btw the 23rd & 24th, including an 11:00 candlelight service on Christmas Eve. Brad and the other staff don’t get home until almost 1:00 Christmas morning. As it is, our kids know we don’t open presents as soon as they wake up bc Daddy is still asleep. Thankfully our church opted not to hold Sunday services this year to give leadership time with their families. I fully understand the debate but am thankful we got that time to exhale this year. Hi Lori! Yes, since posting this, I have heard that a lot of churches did not hold services on Christmas Day. I am so happy to hear that you were able to have a morning at home without having to “work.” Andy and I definitely appreciate your insight and point of view! God bless you guys and Happy New Year, sweet friend! Give your boys a kiss for us! Can’t wait to see pics of your new little one! We didn’t know what we were going to do. I wanted to on go 12/24. I had a hard time thinking of pulling the kids away from the new toys, cozy family time, etc. to get dressed and out the door in time for church. (Like you mentioned, stress!) My hubby liked the idea of going on 12/25 as well as 12/24. He reminded me that this is yet another reason why it’s “better” opening gifts the night of Christmas Eve, the way he grew up. 😉 As the night unfolded, we came home from dinner after church 12/24 and Jay got sick…and stayed sick for 24 hours. That answered that! Well I am so sorry to hear that Jay got sick! Oh no! Well, at least it was a 24 hour thing! I hope everyone is feeling healthy and enjoying the new year, Ginny. I don’t know if I would ever want to open all the gifts on Christmas Eve. I think we all like to stick to the traditions we grew up with, right? God bless you guys! Happy New Year! We went on Christmas day but not Christmas eve. The stressful part was making my kids wait until the evening to open presents. We ended up letting them open one each before leaving for church. Other than that, it was a great way to spend the morning and helped us refocus on the true meaning of the day. That is so great that you made it a priority. I think it’s hard to switch things up if kids are used to opening the gifts in the morning. Thank you for sharing your experience! God bless you guys and Merry Christmas! !